smyth : aboriginal rafts and canoes, 1878. Robert Brough Smyth : Aboriginal Rafts and Canoes, 1878. The Aborigines of Victoria: With Notes Relating to the Habits of the Natives. 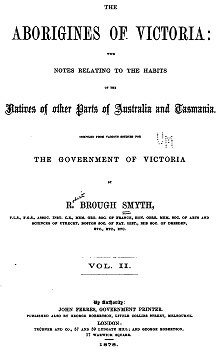 Despite the specific title, Syth's comments widely on watercraft from King George's Sound, in Western Australia, to Tasmania. They have a variety of methods of catching fish. Two or three women watch the shoal from the beach, keeping opposite to it, while twenty or thirty men and women take boughs and form a semicircle out in the shallow bay as far as they can go without swimming, and then, closing gradually in, they hedge the fish up in a small space close to the shore, while a few others go in and throw them out with their hands. By this primitive method, skillfully executed, I have seen a large quantity of fish caught. *See Fig. 253, from a native drawing. Native of King George's Sound. too shallow for them to swim in and spear and catch a great number of fish weighing from ten to fifteen pounds each. On the Murray River they use boats made of a single sheet of bark, and on the north-west coast of Western Australia they make rough log canoes for fishing. In South Australia I have seen them take out to sea a beautifully- made net, five or six feet wide and fifty or sixty feet long, weighted at one edge so that, while treading the water and holding it out at full length, parallel with the shore, it is in a vertical position six feet deep. Others — men and women — would then swim out for a quarter of a mile or more, and, closing in, drive the fish against the net and then spear them. The Murray River natives use spears for fishing made of the reed which grows in vast beds from Swan Hill downwards for thirty miles, and also at Lake Moira above the confluence of the Goulburn River. These spears are pointed with bones of the emu, or such substitute as they may be able to procure. They also use heavy jagged spears made of miall (sic) or other very hard wood for fishing. Much ingenuity is displayed in the manufacture of nets by the Coast tribes and the natives of the Murray River, from string which, where bulrushes grow, is made from the fibrous root of that plant, called on the Murray Balyan. They peel off the outer rind of the root, and lay it for a short time in the ashes ; they then twist and loosen the fibre, and by chewing obtain a quantity of gluten, somewhat resembling wheaten flour, which affords a ready and wholesome food at all timed to the tribes which inhabit the vast morasses in which the reeds and bulrushes abound. They chew the root until nothing is left but a small ball of fibre, which somewhat resembles hemp. These balls are then drawn out, and rubbed with the palm of the hand on the bare thigh of the operator, while a small wooden spindle twirled with the fingers of the other hand twists and receives the string. Among the few specimens of art manufactured by these primitive people none are more like our own than the nets of South Australia and Victoria. Fishing with nets seems to have been a very ancient practice in different nations. Suetonius states that Nero was accustomed to fish with a net of gold and purple. Plutarch mentions corks and leaden weights as an addition which nets had received. Homer supposes that nets were not used by the ancient Egyptians. The Egyptians did, however, use weirs and toils in their fisheries. The use of fish-spears appears very clearly in the paintings of ancient Egypt. The annexed plates (Figs. 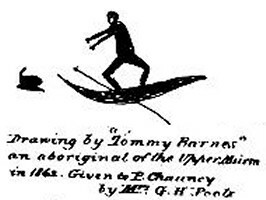 253 and 254) are from drawings with pen and ink by an untaught Aboriginal lad of the Upper Murray, known as "Tommy Barnes." No. 1 gives a good idea of a war-dance at the top and a corobboree beneath, in which the dancers wear girdles round their bodies, and fillets of emu feathers or of small boughs round their legs, and hold waddies in their hands, which they energetically strike together, keeping time with the dance. The women, fourteen in number, sit together, with their hands uplifted, in the act of beating time on stretched skins, while behind them is a tree with a bird on the top of it. In the same picture the artist indicates the method of emu-stalking and of fish-spearing. No. 2 also illustrates a variety of subjects : a native man in a canoe catching a turtle; a pair of emus standing by their nest, and a man throwing a spear at one of them ; another man throwing his dowak at a large lizard ; another in a canoe spearing a fish, which is very well drawn; nine men are engaged in a mimic war-dance for the amusement of a squatter and his wife, who are looking on ; they are brandishing boomerangs, clubs, and shields, and one has a pipe in his mouth. * Paper read before Anthropological Institute, 17th April 1871. Man in a canoe catching a turtle, Figure 254, detail. to the station, which stands in the background. There is much spirit in these drawings, the attitudes of some of the figures, and the faces of some of the women, are very good. If carefully examined, I think we cannot avoid the conclusion that Tommy Barnes is a close observer, and is possessed of some artistic skill, which, if cultivated, would have enabled him to draw well. These sketches were hastily drawn, with no particular object in view, and probably only for his own amusement. They are also expert in spearing fish at night from their canoes. 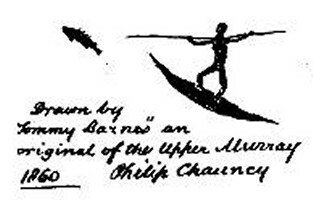 The canoe -which is simply a sheet of bark cut off a tree with a bend in it — is allowed to drop silently down the stream ; a small fire is lighted in the bow, on a raised piece of clay, of a peculiar resinous wood, which bums with a clear, bright flame; the fish, attracted by the light, swim up to it, and are immediately speared. The canoes, being so frail, require great steadiness in their management, though on the Lower Murray I have seen them large enough to carry a dozen men at once. These large canoes are cut off the giant swamp-gums. They also snare the wild turkey or bustard. They approach as they do when stealing on an emu ; but instead of a spear, they carry a long light stick, at the extreme end of which is tied a fluttering moth, as well as a strong running noose hanging just below. The bustard is so intent on looking at the moth that he does not notice the noose, which the cunning black at last succeeds in slipping over his head. A hole is made in the earth, and lined with stones ; in it they make a fierce fijre, until the stones become almost red hot ; the kangaroo, or what they intend to cook, is then placed in the oven, on the top of which some more hot stones are placed, and the whole covered with earth ; the heat of the stones and the confined steam together cook the meat. The natives, as a rule, are splendid swimmers, though there are tribes living in dry country who will not go near the water, and cannot swim a stroke ; but among River tribes water is second nature — children hardly able to walk swim like ducks. It is strange to watch a blackfellow catching ducks by diving. He drops down the stream with merely a small portion of his head above water. When he is close to the flock, he quietly dives, and draws one or two birds under the surface ; these he at once kills and tucks them under his belt ; he then rises to the surface, but only shows his nose ; in a moment he is down again, and another duck or two disappear. I have seen a black take seven ducks in this manner without creating any suspicion in the flock. They are also expert in noosing wild-fowl. A small family of the Yantruwunter go from the end of Strezelecki's Creek down to Flood's Creek, and there meet natives of the Darling back country. I think that the native mentioned by Sturt as coming to his camp (I think at Fort Grey) was probably one of this family. Capt. Sturt mentions that he made signs of great waters to the west or north-west, and also represented the paddling of canoes ; I think this really represented the hauling in of a net or "Yammcu." I have seen such a pantomime, but I never saw a canoe or any place where bark for a canoe had been stripped in Central Australia. The largest article in the shape of a covering of any sort which I have known them to manufacture — with the exception of the opossum rug — is a circular mat, about three feet six inches in diameter, made out of rushes by the lubras, on the banks of Lake Alexandrina, into which the Murray empties, and used by them and not by the men. On the coast it was quite a picturesque scene of a night, when the waters of some little bay were lit up with scores of lights, which were continually moving and forming a variety of fantastic groups. These lights were pieces of blazing bark, carried by men, women, and children, who, each armed with a spear formed of a straight pointed young sapling, waded about the shallow waters in pursuit of the fish brought in by the rising tide. The blacks appear to enjoy a certain immunity from the sharks ; for although I have known numbers of men and women to swim in and out off a large quantity of fish from the schools of schnapper, extending sometimes more than a mile each way, which visit these coasts about December, and which schools are invariably followed by a host of sharks, ever on the watch to pick up the weakly fish, yet I never knew of an instance where a black was injured. That may, however, most probably be owing to the sharks being in a manner gorged at the time, as I have also known the blacks to swim off to the stranded carcass of a whale to get the coarse meat — or Ereng as it is called — when the sharks have been almost as thick round it as flies on meat during summer. The blacks are very expert in getting the schnapper alluded to. For days previous, scouts are posted on the various look-out places to give notice of the approach of the fish ; and as soon as the alarm is given, the greatest excitement prevails — men, women, and children rush recklessly into the water, swim towards the school, cut off a lot of the fish, and then, forming a semicircle, swim behind the fish and drive them into shallow water, where they are dexterously and quickly speared. To give you an idea of the quickness of the blacks, I can mention an instance in which three blacks, another white, and myself, speared upwards of thirty large schnappers in about twenty minutes. Another common way of catching mullet and whiting, and such sized fish, is, at the time the tide is coming in, for a black to take a bough in one hand, a spear in the other, and a piece of lithe sarsaparilla root — which abounds on the coast — round his neck ; he then gets behind a school of fish, moves the bough with his hand, causing a shadow to fall on the water, before which the fish rush away in terror, till he gradually gets them into water from two to three feet deep, where he can deal with them to a certainty, for every time he darts his spear he is sure to strike a fish. The black gives each a bite at the back of the neck, and strings it through the gills round his neck till he gets enough, when he walks ashore, broils his fish, takes his meal, and under the shade of a tree rests from his labors. Jackson, when the boat was upset by a sudden squall, and sank. Charlotte and Jackson rose to the surface, but neither Manson nor the children could be seen. Charlotte swam about for a considerable time in search of Manson and the children, whom she was to rescue, if possible, at any sacrifice ; but finding no signs of them, she turned to Jackson and said — " I will take you on my back and swim ashore." Jackson, however, was equally generous ; and, although they were then out of sight of land, refused her offer, saying that he would do the best he could for himself. Charlotte then got one of the oars, which was floating close by, and stripping herself of the woollen and cotton shirts which she had on, she rolled them round the oar for Jackson to lay his breast on. They thus floated on for some time, till the distance between them gradually increased. Charlotte eventually lost sight of Jackson, and never saw him again. On nearing the coast, near Avoid Bay, where the surf breaks with awful violence and a noise like thunder for miles off the land, she met with great difficulties, practised and wonderful swimmer as she was, and had to dive time after time repeatedly, to prevent being dashed to pieces against the rocks. She succeeded at length, after almost superhuman efforts, in reaching the land about dusk, after being in the water from the early part of a summer's day till then. She assured me, and I did not wonder at it, that when she made the land, and attempted to walk up the beach, she fell down quite exhausted. To increase her troubles, she shortly afterwards saw at a distance some of the blacks belonging to that part of the coast, and being afraid of being captured by them, concealed herself in the scrub, and remained there all night. Next morning she started, and travelled cautiously on, till, finding some cattle tracks, she followed the tracks till she came to the herd, which were in charge of a white man, who kindly took her to the hut, and clothed and fed her ; and, when suffi- ciently recruited, she went into Port Lincoln, where I saw her, and listened to her recital of the loss of her husband and children, and her own narrow escape. The natives of this place probably drew the principal part of their food from the woods ; the bones of small animals, such as opossums, squirrels, kangaroo-rats, and bandicoots, were numerous round their deserted fire-places ; and the two spears which they saw in the hands of the man were similar to those used for hunting in other parts. Many trees, also, were observed to be notched. * An Account of the English Colony in New South Wales, by Lieut.-CoL Ck>Uiiu, p. 480. The character of the weapons made by the natives of Tasmania, the absence of ornament, their using their clubs as missiles, and throwing stones at their enemies when all their clubs were hurled, or when they desired to keep their clubs for protection, indicate a condition so much lower than that of the Australians, that one is not unwilling, with Dr. Latham, to seek in other lands than those from which Australia was peopled for their origin. Their implements were a vessel of bark, very neatly made, for holding water, and baskets of different forms, like those used by the natives of Australia. The native names of the baskets were Treena, Tillti, and Trugkauna. Large shells were kept for holding water and for conveying it to the sick. The natives necessarily had occasionally to cross rivers and arms of the sea. Dove says that "the contiguous islands of the Straits were frequently visited by the tribes located on the northern coasts of Tasmania. A species of bark or decayed wood, whose specific gravity appears to be similar to that of cork, provided them with the means of constructing canoes. The beams or logs were fastened together by the help of rashes or thongs of skin. These canoes resembled, both in shape and in the mode by which they were impelled and steered, the more elegant models in use among the Indians of America. Their peculiar buoyancy secured them effectually against the usual hazards of the sea." From another source I learn that when, during their excursions in the autumn, which were supposed to be from west to east, and in the spring from east to west, and they came to an arm of the sea, or a large river, or a lake, they made a kind of raft, somewhat like the catamarans of the people of Torres Straits. This raft was formed of the trunks of two trees, about thirty feet in length, and laid parallel to one another, and at a distance of five or six feet. The logs were kept together by four or five smaller pieces of wood, laid across at the ends, and fastened by slips of tough bark. In the middle was a cross timber of considerable thickness, and the whole was interwoven with a kind of wicker-work, this raft was propelled by paddles with amazing rapidity. Such a vessel— if vessel it can be called — would carry six or ten persons. When it had served its purpose, it was usually abandoned; and when Tasmania was first colonized, the whites not unfrequently discovered these rafts or their remains on the sea-shore, or on the banks of the rivers and lakes. The names of the canoes were Malanna, Mungana, and Munghana. Mr, Hull says that there were formerly many accounts of the drowning of natives who embarked in these catamarans for the purpose of visiting the neighbouring islands. Their bodies were found on the beaches. Geoff Cater (2014) : Robert Brough Smyth : Aboriginal Raft and Canoes, Victoria, 1878.